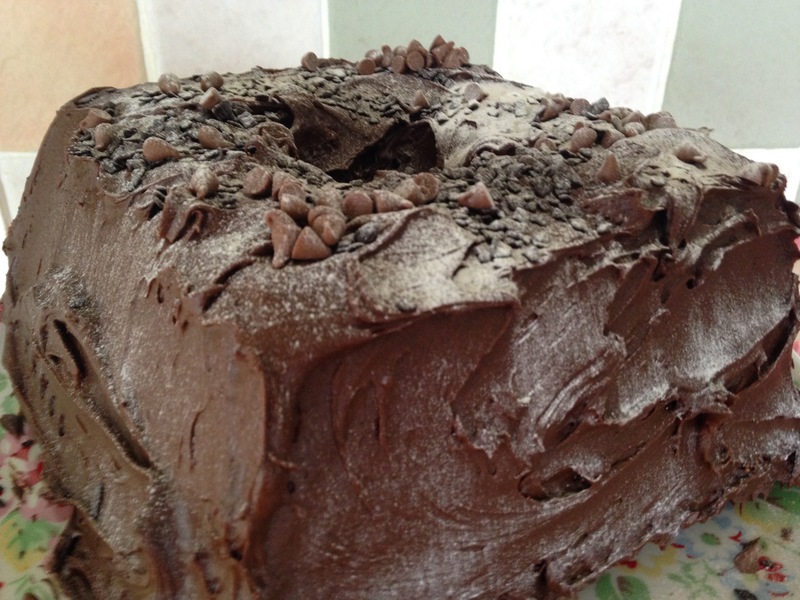 Peanut Butter and Chocolate Bundt Cake- from The Clandestine Cake Club’s A Year Of Cake March Bakealong. As you know, I love any excuse to bake and even more of an excuse to get one of my prized Nordicware bundt pans out! Ever since the second Clandestine Cake Club book “A Year Of Cake” was published last September I’ve been keen to bake the mouthwatering Peanut Butter and Chocolate Cake which my friend Sharon Clarkson contributed to the book. Sharon is organiser for the Pudsey and West Leeds Clandestine Cake Club and nearly two years ago she organised an event where we had to bake cakes from around the world. I created a Mojito and Coconut Tres Leches Cake which also ended up being put in the “A Year Of Cake” book. 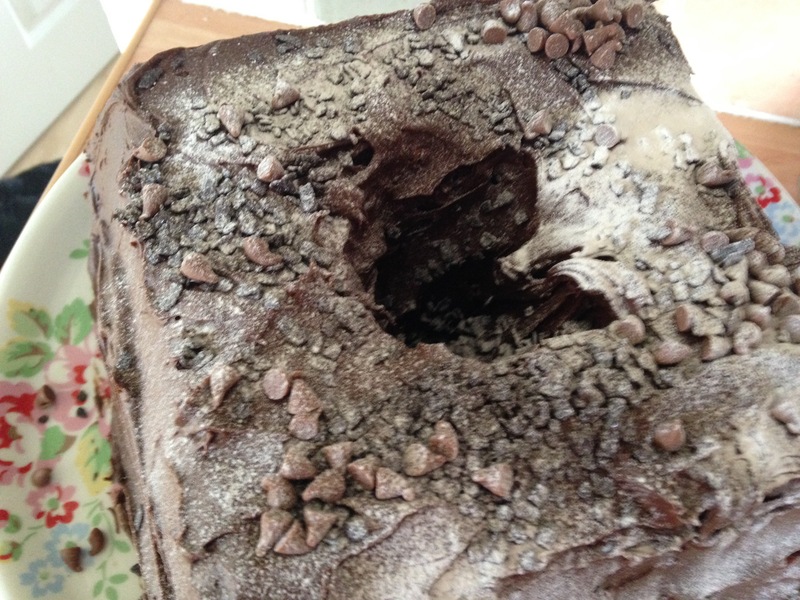 Sharon created a delicious peanut butter and chocolate bundt which was absolutely heavenly. So when the recipes were revealed when the book was published it was exciting to see Sharon’s recipe had been accepted. The recipe testers decided though, that they wouldn’t have it as a bundt cake but as an ordinary layer cake. Lynn Hill, the founder of The Clandestine Cake Club has been organising a monthly Bakealong of recipes from the book. If you want to take part you tell Lynn which recipe you would like to bake from that month’s chapter. There are usually between seven and nine recipes for each month. Sharon’s recipe had been added to the book to commemorate the date of the London Marathon which is a link with its favours of a Snickers bar. Who remembers Snickers bars being called Marathons? Can’t remember offhand when the name changed but I’m sure it was when I was a teenager. I am totally in awe of anyone who runs a marathon. I started running last September and have gone from not even running at all with my knees aching to running for 20 minutes non-stop. Of course I run at a snail’s pace but I’m working on getting faster as I have signed up for the Race For Life in York at the end of June! I’m not sure whether my family will be there handing me a slice of chocolate and peanut butter cake at the finish line but they’ve assured me they will be there to cheer me on! Last Tuesday I had a very special photo session in my kitchen. I’ll be able to tell you more about it as soon as I can but I needed to have some cakey props in the kitchen. So the opportunity to bake the Chocolate and Peanut Butter cake was perfect for the photos. I chose to bake it in my Nordicware Square bundt pan as I knew it worked well as a bundt! To bake the bundt I first had to mix crunchy peanut butter (I always use a good quality brand with no sugar in it, such as Meridian or Whole Earth) with some icing sugar. This was then put aside as I made the rest of the cake. In a bowl some cocoa powder, plain flour and salt was sifted and mixed together. I then got out another bowl and then creamed together some butter and sugar until it became light and fluffy. To this, I added eggs carefully to ensure the mixture didn’t curdle. After this I took it in turns to add the flour mixture along with a mixture of buttermilk, sour cream and vanilla extract. Finally I added some chopped plain chocolate and folded it into the batter, along with the peanut butter. 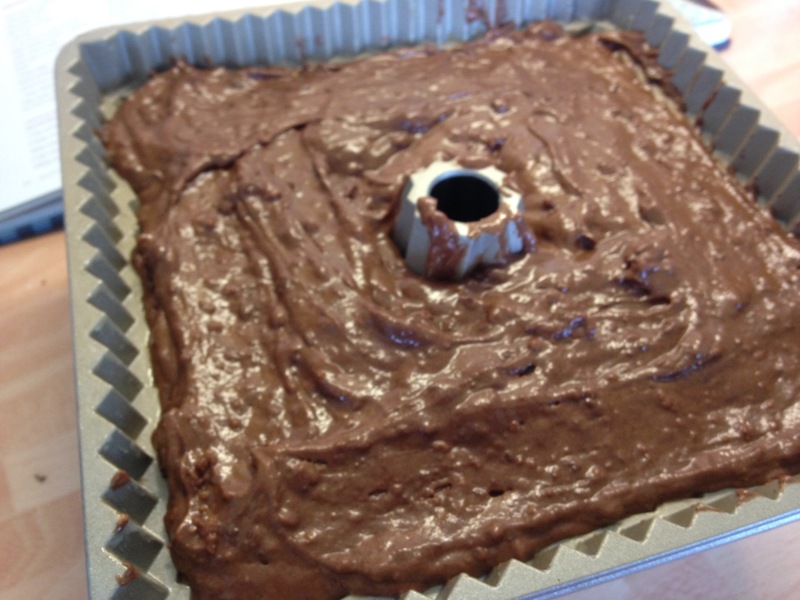 The Chocolate and Peanut Butter Bundt Cake ready to be put in the oven. 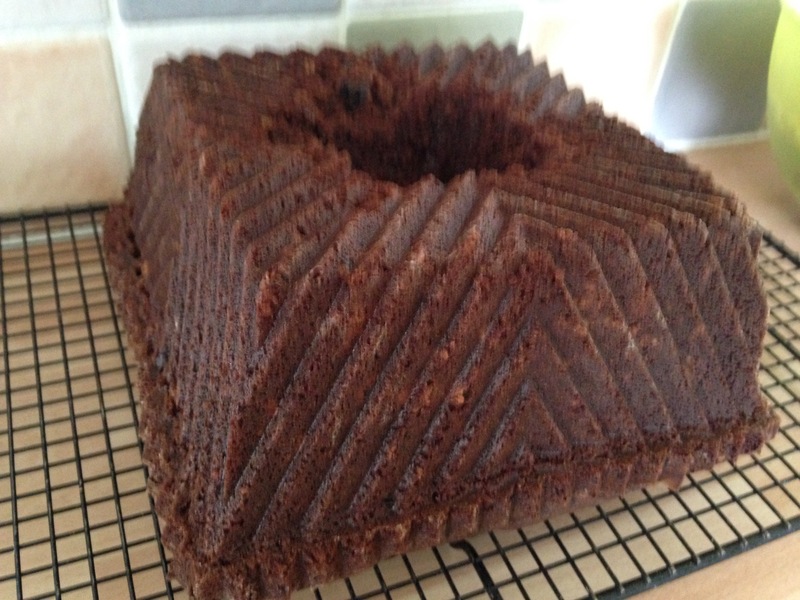 I absolutely love my Nordicware Square Bundt pan which was a Christmas present. I always hope and pray that my bundts come out of the pan in one piece, luckily this time it did! I had prepared the cake before the photographer arrived at my house and it was all ready to be iced if he needed me to do it for the photos. I was asked to make up the icing and was photographed mixing the icing. 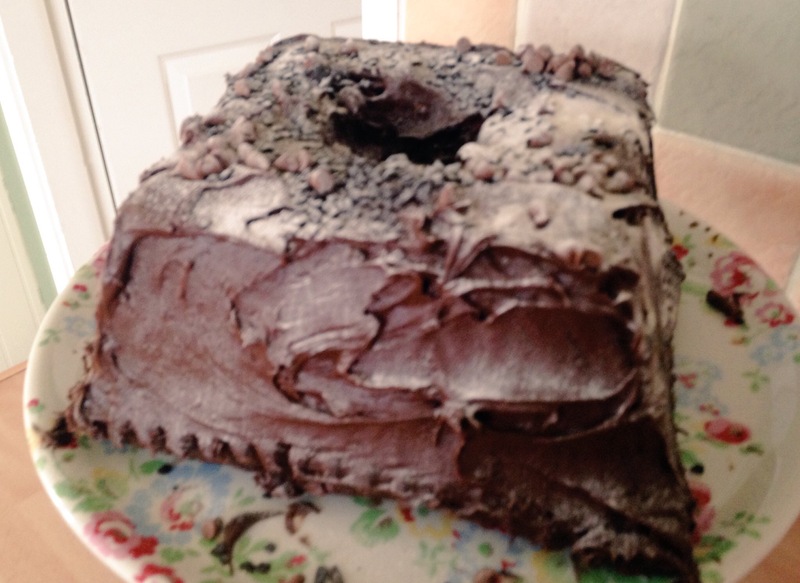 The icing was a heavenly mix of cocoa powder, butter, icing sugar, vanilla extract and evaporated milk which turned into a delicious fudgy frosting. I then was photographed spreading the icing onto the cake with a large palette knife. Later, as the photographer needed me to bake and ice other things, I put the cake aside and added chocolate chips, sprinkles and icing sugar on afterwards. Ready to be eaten. The. bundt’s fudge icing was jusr divine. 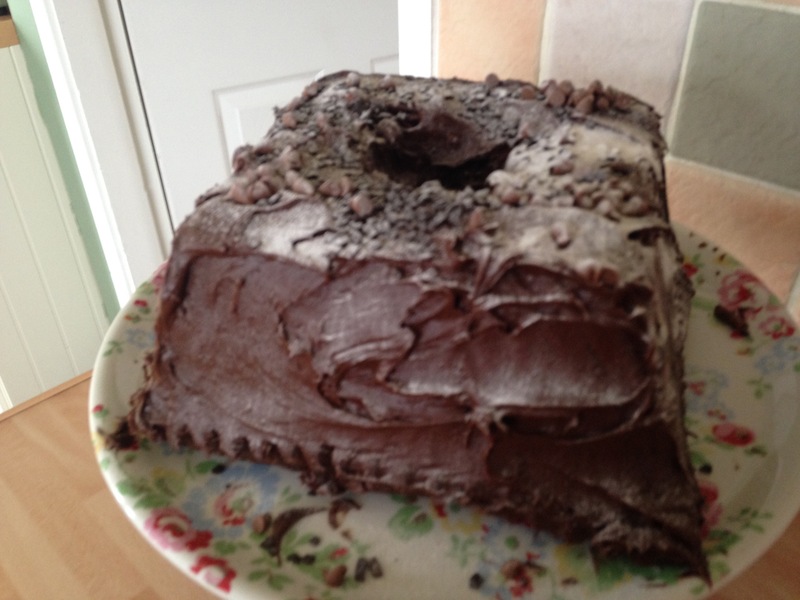 i was a bit cack handed with the icing sugar and the chocolate sprinkles! A perfect example of chocolate heaven. By the time the photographer left it was about 3pm and I was very hungry. I couldn’t help it but I cut myself a piece of the cake for my lunch. It was gorgeous. The rest ended up being eaten in bits over the next few days by my family. I will definitely be baking the cake again! Previous Post Wet Wet Wet at Leeds First Direct Arena Review- March 4th 2016. Next Post Wet Wet Wet at Newcastle Metro Radio Arena Review- March 11th 2016.